The Beatles honed their stagecraft and global hits on the streets and stages of Hamburg where Kevin Keegan would later grace the pitch. Now, there is a new English invasion with some of the country's brightest talents opting for the Bundesliga as the stage on which to best develop. The German top flight's reputation as a breeding ground for the brightest and best the young generation has to offer is well documented. But up until this season, it has been largely confined to developing homegrown talent with Borussia Dortmund's USA star Christian Pulisic a notable exception to the rule. bundesliga.com looks at why the Bundesliga is now becoming the destination of choice for English youngsters seeking to take their fledgling careers to the next level. The English Premier League has gained a global reputation for excitement, passion and being brimful of many of the highest profile footballers the planet can boast. For a fan, it might seem heavenly, but looking at the league from a young English player's perspective, the prospect of making it to the big time is hellish. Nearly 70 per cent of Premier League players are foreign-born, according to a UEFA study, while the bigger your club, the more hazardous the route to the first team. A CIES Football Observatory study showed Arsenal, Manchester City and Chelsea, for example, gave just 23 per cent, 17 per cent and 16 per cent of minutes to homegrown players respectively in 2016/17. In the Bundesliga, just under half (49 per cent) of players come from outside Germany, giving youngsters a chance to work through the ranks and not have the glass ceiling that prevents their English counterparts playing on the very biggest stages. The contrast at the 2017 Under-21 EURO, for example, was stark: the England squad totalled just over 200 Premier League appearances between them; Germany, who won the tournament despite having many first-choice players with the senior squad at the FIFA Confederations Cup, had a collective tally in excess of 1,000 Bundesliga games. That there is a much clearer pathway to the first team has attracted a host of talented young English players to the Bundesliga this term. Jadon Sancho is one of the permanent movers, joining Borussia Dortmund with his first professional contract. Reece Oxford was "desperate to return" for a second loan spell at Borussia Mönchengladbach, where he is joined by Mandela Egbo, and - as of July 2017 - Keanan Bennetts, who arrives from Tottenham Hotspur. A host other names are or have been in the Bundesliga system. Kaylen Hinds is on loan at Greuther Fürth in the 2 Bundesliga from Wolfsburg, having left Arsenal, Ryan Kent spent the first half of the season with Freiburg and Danny Collinge is plying his trade in VfB Stuttgart’s youth system. Kevin Danso, an Austrian international who came through the youth system at Milton Keynes Dons, has become a first-team regular with Augsburg this season, despite being only 19. But the most recent is Everton’s Ademola Lookman, who enjoyed a sensational second half of the season with RB Leipzig. Just days after signing for the club, the London-born teenager came on as a late substitute at Oxford’s Gladbach on Matchday 21, and scored the winning goal with a clinical finish into the corner. Talk about repaying the faith! "We tried to persuade him not to because I think it is a big challenge for his development," said Everton boss Sam Allardyce. "I hope he proves us all wrong." Watch: Lookman's dream debut against Gladbach! The experienced Premier League coach said Lookman’s move was "one of the most unusual situations" he had ever encountered, but it is what Lookman was after. "I wanted a new challenge, a new league," Lookman said. "The Bundesliga has a great reputation in England. Top stadiums with good, physically strong and disciplined players and games played at a high level. [Leipzig sporting director] Ralf Rangnick played a big role, too. He had been watching me for a long time and has always maintained contact. He's a fantastic guy." When Sancho joined Dortmund from Manchester City, the 17-year-old was given the number seven shirt recently vacated by Ousmane Dembele. It was a clear statement from the club: This kid is going to play. Higher than highly rated, Sancho has clearly seen Pulisic prosper after breaking into the first team at the same age as him, and Dembele, 20, make giant strides in 12 bewilderingly fruitful months at the club and thought, 'That could be me.' He duly seized that opportunity, making an impressive mark in his first top-flight season and pushing for senior international recognition. Watch: Sancho was named Bundesliga Rookie for January 2017! "When he arrived he was immediately training with the first team but it was my job to introduce him to my U19s to give him match time," Dortmund U19s coach Benjamin Hoffmann told Sky Sports. "It's really like, 'Who are your best players? Are they able to train with us?' Even yesterday, four of my players went with the first-team training squad," Hoffmann added, reiterating once again that opportunities are a plenty in the Bundesliga for a young player with ambition to prove himself. Oxford's move to Gladbach was directly influenced by the success of a fellow Premier League player with the Foals. "Andreas Christensen did well," said Oxford of the Denmark international, who has emerged as a key player at Chelsea after two seasons on loan at Borussia-Park. “Hopefully I can follow in his footsteps and help the team to progress." Oxford is another to have developed with regular first-team action, and confessed that he was "desperate to return" to the Borussia Park after West Ham initially ended his loan spell prematurely. He got his wish, and enjoyed an impressive Rückrunde. The same is true for Mandela Egbo, a 20-year-old right-back who signed for the Foals from Crystal Palace in 2015 and has progressed well in the reserve side. Having trained regularly with the Dieter Hecking’s first-team this season, Egbo made his first-team debut against Hannover after three years with the club. Again showing that with patience, development and ambition, a chance in the Bundesliga will come. The Bundesliga can match or in many cases go better than the Premier League for goals, excitement, passion and huge crowds. The one major difference for young English players is that they get to do what they want to do: play. They experience what it is like to be in the big boys' playground by being on the swings and roundabouts with them, rather than being told to watch from the soft play area. For Sancho, Hinds and Danso, that opportunity was enough to convince them to sign permanent deals. For Lookman and Oxford before them, who would traditionally have dropped down the leagues in their native country to get first-team football, it marks a significant upgrade as it provides an almost identical taste of what they would find at the top level in England. Watch: Danso scored his second Bundesliga goal against Borussia Dortmund! "I think that's the problem with players my age today, especially in England. We get too comfortable, too quickly," Danso told Sky Sports recently. "I don't think many of us realise how big an opportunity this is. West Ham and Everton will be hoping it means the youngsters they have loaned out will return ready for the rigours of the Premier League. 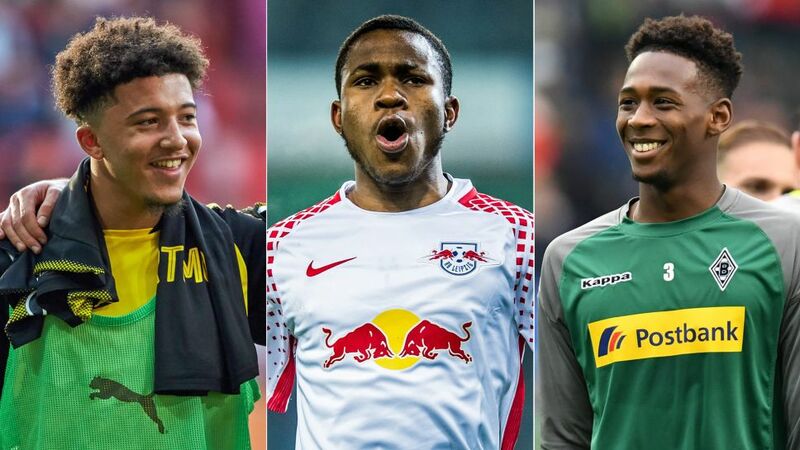 Then again, Oxford, Lookman and now Bennetts, just like Danso and Sancho, may realise they like playing regularly in the Bundesliga too much to go back.